By 2017, 89% of marketers expect customer experience to be their primary differentiator (Gartner). Is your brand ready? Whether interacting through an eCommerce website, social media, email, mobile app, or brick and mortar store, your online and offline experience needs to align with a customer's needs in real-time, and in a way that suits their preferences. This is a challenge that requires a foundation of a rich customer database that unites online and offline engagement, journey mapping, and personalization capabilities. The biggest obstacle to orchestrating a unified online and offline experience for many mid-market retailers, struggling with a variety of legacy systems, is an integrated database. Separate silos of customer information for print, digital and in-store POS data just won't do. Data from interactions needs to be captured at every point possible, and unified into a platform where it can be analyzed and segmented. Only through customer profiles based on robust, cross-channel information will you be enable to apply that data into effective omnichannel messaging. Beyond the analysis derived from demographics, purchase history, and customer service interactions, your data must lead to marketing actions. For example, if a loyal customer regularly shops on your eCommerce site but rarely deviates from their normal product types, perhaps a printed catalog with a coupon for a different product type could get them to explore further offerings. In this case, this customer may seek those products from another retailer, and your ability to acquire new revenue from them also creates additional market share for your brand. You can also automate messaging based on the actions and preferences of your customers, such as an abandoned cart or a lack of purchase by a high-value customer during a period of time. The experience is seamless and omnichannel for your customer, which can make the difference between hitting your revenue targets for the year... or not. It's not uncommon for consumers to see a billboard, magazine ad, or TV ad, then search for that company online. Shoppers may even treat brick-and-mortar stores as showrooms, only to do their shopping online later. Attribution in such cases is difficult, but consistency in creative is not. Align product highlights and offers across all channels to provide an accessible and understandable brand experience. You don't want your audience to be confused when they cross channels. Strive to create a seamless online and offline experience with matching imagery, messaging, and style. This applies to the personalization we mentioned above. Use your customer data to make sure your messaging is appropriate regardless of channel. A female customer who purchased headphones online isn't going to see the relevance of a direct mail coupon for men's shoes. As mentioned above, omnichannel experiences start with omnichannel data. This is where you gain an understanding of how to provide the most effective and appropriate journey for your customers. It's simple enough to design and execute an individual email campaign, direct mail piece, or social media strategy. Integrating them all is more challenging, but it shows your customer that you're paying attention to how they interact with your brand in terms of both content and channel. This is where journey mapping is helpful (click to read our previous post which includes a journey mapping template). While the customer may jump across channels along the way, the successful marketer needs to see the customer’s path to purchase as a single journey down a multi-lane information superhighway. 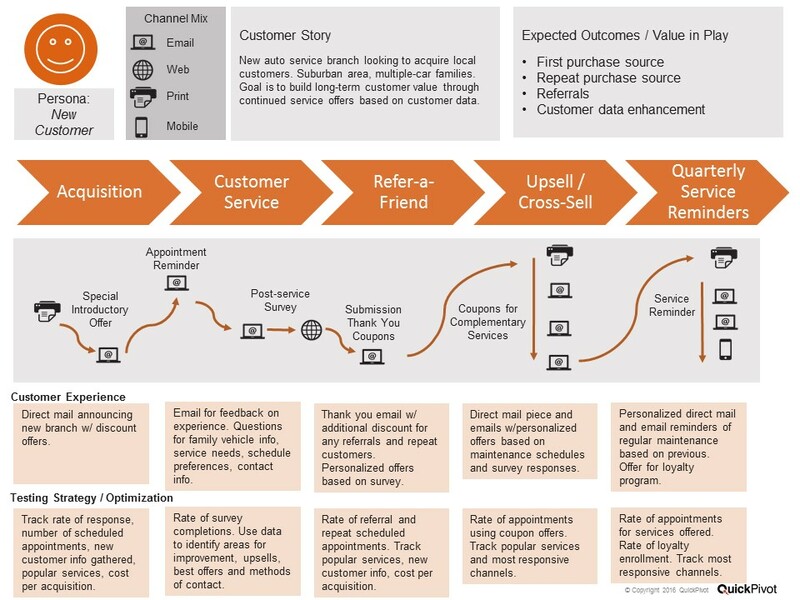 If you visualize the customer journey as a single continuum, you can anticipate these lane shifts and be ready to reach your customers wherever they are, whenever they’re there. And when you’re prepared to see (and hear) the journey holistically, the complexity of the multi-channel campaign disappears, allowing you to operate at the speed of your customers and unify their online and offline experience. Utilize all data sources across online and offline channels. Beyond digital channels, your direct mail and phone calls can all be tracked, and that information can further inform tactics. Custom 800-numbers for order processes and customer service, QR codes and personalized landing pages can translate offline campaigns into digital data. Leverage POS opportunities to push customers to different channels. An in-store visitor can be added to an email list for coupons during checkout. An online shopper can be invited to an in-store only sales event. URLs and QR codes can be printed on receipts, on product packaging, and on in-store signage that encourage product and customer service reviews. Find these opportunities and get the value from them. Incorporate social sentiment listening and geofencing tactics. Listening to your customers' opinions on products via reviews online or via an brand's app provides only part of the story. Social listening to sentiment allows a brand to also respond quickly to both purchasing intent with exclusive, highly targeted offers and address any negative brand experience, mitigating the risk for that customer and others like them. Apply predictive analytics to find commonality between customer groups to maximize the lifetime value of your current customer, cross-sell/upsell effectively, and boost ROI for marketing tactics to acquire new ones. This intelligence can be leveraged for better segmentation for direct mail and email campaigns, digital advertising and retargeting spends, and to create exclusive offers for early-adopter trendsetters and influencers. Armed with information about your customers’ preferences and behaviors, you’ll be able to create successful cross-sell, upsell, and loyalty programs by focusing on the customer instead of the channel. You will be able to create meaningful segments of your customer and prospect bases, increasing the likelihood that your offers will resonate and generate sales.